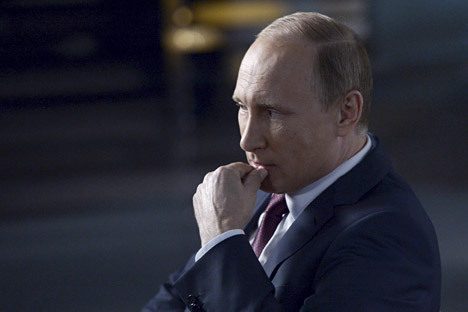 Russian President Vladimir Putin answers questions by Russia 1 channel's anchor Vladimir Solovyov (not pictured) during an interview in Sochi, Russia, October 10, 2015. Russian President Vladimir Putin will not attend the Asia-Pacific Economic Cooperation (APEC) summit in Manila, a Kremlin spokesman told Reuters on November 12. Russia will be represented at the summit by Prime Minister Dmitry Medvedev, according to the report. Putin called Philippine President Benigno Aquino III on November 12, to relay his decision not to attend the summit. The Russian President informed Aquino that he had to attend to some domestic issues, including the ongoing investigation on the crash of the Metrojet aircraft in Egypt, Abigail Valte, deputy spokesperson for the Philippine President told reporters in Manila. Indonesian President Joko Widodo also said he would not attend the summit, which begins on November 18.